Quiet timbered setting off Montana Highway 49. Bordering beautiful Glacier National Park (7 miles from entrance, 32 miles from Going-to-the-Sun Highway.) Established in 1947. We have 25 units with queen beds, 2-bedroom units, color TV, combination tub/shower. Our rooms are in excellent condition and inspected for cleanliness daily. 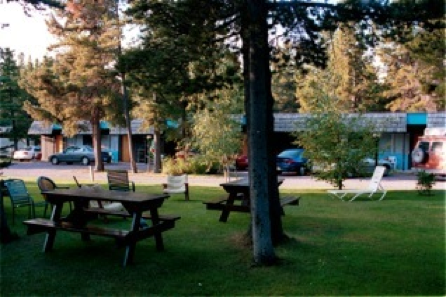 We are a family run motel, within walking distance of several fine restaurants, bicycle rental, horseback riding, laundromat, grocery store, the East Glacier Golf Course, and in the heart of world famous trout fishing. Shuttle buses run daily in summer to various spots in Glacier National Park. The Amtrak Train Station is less than one mile from our door and we provide pickup service. Friendly desk staff is always ready to provide travel suggestions and local information.